The evolution of in vitro, in vivo and ex vivo assay models continue to provide researchers with more relevant and quantitative data, enabling development decisions to be made sooner. This year’s LRIG program reflects the breadth of these better assay models. As always, attendance is free and lunch is included, but please register to receive updates and help us estimate attendance. Vendors, please visit the vendor info page. 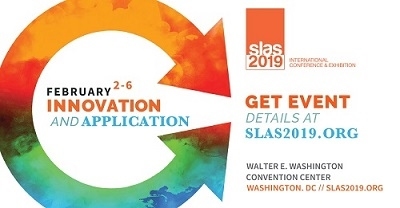 This year, SLAS has graciously provided a full registration for the raffle. You must be a registered attendee to be eligible to win. Cellular research is optimal when using physiologically-relevant cell phenotypes and genotypes of human origin. This assertion has accelerated the adoption of primary cells, stem cells, and increasingly, patient-specific cells in drug discovery. Over the last five years, technological improvements in three-dimensional (3D) cell culture technology, to better mimic in vivo physiology, have also accelerated, not only in the areas of cancer and neurological research, but also in the assessment of clinical candidates for metabolic and toxicological liabilities. Furthermore, 3D cell culture is facilitating novel approaches to both the scale-up and manufacture of biologics, including those used in immuno- and stem cell-based therapies. In this presentation, existing, and future, developments in 3D cell culture technology, (including the use of phenotypically-relevant human iPS cells) on fundamental research, drug discovery and biologic manufacture will be addressed. Delineation of an intra-tumor microenvironment in a dynamic spatio-temporal setting is required owing to its clinical relevance in many cancer indications. Majority of solid cancers represent a highly complex tumor microenvironment wherein a dysregulated phenotypic context impacts treatment outcomes at a personalized level. We have developed and validated an ex-vivo platform technology (CANscriptTM) using patient material (tumor, autologous ligands and immune cells) to predict tumor efficacy in the clinic across several drug classes (Majumder B et al. Nature Comm., 6:6169:1-14 2015). Tumor Infiltrating lymphocytes are required for the function of immuno-oncology drugs. In order to understand the role of functional immune phenotypes, we evaluated a cohort of patient tumors using CANscriptTM. Data suggests this technology can be used to understand MOA in I-O along with indication scouting, combination testing and general de-risking of cytotoxic, targeted and IO clinical programs. Supporting evidence will be presented. Neglected tropical diseases are significantly underserved by current drug development efforts, mostly due to the high costs and low economic returns. One method for lowering the costs of drug discovery and development for these diseases is to repurpose drugs developed for other indications. I will present the results of a screen of five repurposed libraries to identify potential new lead compounds to treat amebiasis, a disease that affects tens of millions of people and causes ~100,000 deaths annually. E. histolytica, the causative agent of amebiasis, has two major life cycle stages, the trophozoite and the cyst. The current primary treatments for amebiasis, nitroimidazole compounds, do not eliminate parasites from the colonic lumen, necessitating a multi-drug treatment regimen. We aimed to address this problem by developing assays to screen parasites against both trophozoites and cysts, with the aim of identifying a single drug that targets both life stages. We successfully identified eleven compounds with activity against cysts and trophozoites, as well as multiple compounds that killed trophozoites with significantly improved efficacy over existing drugs. Two lead compounds (X and Y) were further characterized for activity against drug resistant parasites and mature cysts. X and Y were both able to kill metronidazole resistant parasites while Y and its analog Y' were active against mature cysts. This work confirms the feasibility of identifying drugs that target both Entamoeba trophozoites and cysts, and is an important step towards developing improved treatment regimens for Entamoeba infection. The interaction of cells of the immune system with cancers is currently a major focus of many research labs and pharmaceutical companies, with a goal of developing more effective cancer therapies. 3D co-culture methods offer the prospect of being able to recapitulate the immune system - tumor interaction, in an in vitro setting. These types of in vitro methods will be important for developing and studying novel therapeutics for cancer treatment. We have used the MC38ova mouse colon carcinoma model in co-culture with fibroblasts and endothelial cells and treatment with CD8+ T-cells, to evaluate several different 3D cell culture technologies. Our goal was to learn the pros and cons of each technology and their ability to generate meaningful data in vitro for guiding cancer immunology drug discovery projects. We will discuss an interim analysis of what we have learned to date from these studies. InSphero’s 3D InSight™ microtissues are utilized in drug discovery research throughout the biopharmaceutical industry because they provide more physiologically relevant information than 2D counterparts, and therefore enable better in vitro to in vivo translation. These scaffold-free microtissues are engineered and manufactured using quality-controlled procedures to ensure uniform size, robust functionality, and reproducible results in a high-throughput compatible format. Here, we focus on applications of the 3D InSight microtissues in (1) drug safety, (2) liver disease drug discovery, and (3) diabetes drug discovery. A collaboration with Genentech and AstraZeneca demonstrates how 3D InSight primary human liver microtissues correctly predicted twice the number of known hepatotoxic compounds compared to commonly used two dimensional primary human hepatocytes (PHH). Building on our liver microtissue platform, we have also developed a 3D InSight Fibrosis model and 3D InSight non-alcoholic steatohepatitis (NASH) model. We demonstrate how various stages of NASH (e.g. steatosis, inflammation, and fibrosis) can be induced in these models. We also demonstrate that 3D InSight islet microtissues, which have been successfully used by all top 10 pharmaceutical companies developing anti-diabetes islet-targeting drugs, sustain their insulin secretory function compared to short-lived, low-purity native islet fractions. By leveraging the wide-ranging applications of InSphero’s 3D InSight microtissue models, which includes an under- development body on a chip technology, we aim to bring robust in vitro to in vivo translatable drug discovery solutions to the biopharmaceutical industry. Mass spectrometry has evolved from a highly specialized technique used almost exclusively for structural determination to one that has found a range of applications within both small molecule and biologics discovery and development. The popularity of mass spectrometry is in large part due to its inherent sensitivity, specificity and direct, label-free, detection. Integration with other technologies (most notably liquid chromatography) has broadened its versatility to rapidly deliver high-value data. This year’s LRIG program reflects the breadth of applications mass spec now serves. As always, attendance is free and lunch is included, but please register to receive updates and help us estimate attendance. Vendors, please visit the vendor info page. With the increased complexity of samples, the typical HPLC coupled with MS technology could be matched to the capabilities of current single or tandem mass spectrometers only by using additional separation or specialized sample preparation procedures. The rise of high resolution/accurate mass (HR/AM) mass spectrometry has enabled significant reduction of this gap and reduction of requirements on chromatography, thus making sample analysis more robust and method development simpler. In this talk, we will discuss the wide applications of accurate mass spectrometry during pharmaceutical analysis throughout each stage of drug development ranging from drug discovery to manufacturing. Sheerin K. Shahidi-Latham, Ph.D., Head of Metabolomics and Imaging MS, Department of Drug Metabolism & Pharmacokinetics, Genentech, Inc. In the pharmaceutical industry, obtaining information about the absorption, distribution, metabolism, and elimination (ADME) of a new chemical entity via a pharmacokinetic study (PK) in a preclinical species is often the first step towards understanding the in vivo properties of a drug-like molecule. Traditionally, much of this ADME work is supported by liquid-chromatography coupled to mass spectrometry, and in the case of tissue distribution, the organs are excised and homogenized in order to accommodate this analytical workflow, thereby effectively eliminating any spatial information. More recently, the complementary use of matrix-assisted laser desorption ionization imaging mass spectrometry (MALDI-IMS) has gained prominence since it provides a robust, label-free detection of drug and metabolites while preserving spatial localization within tissue sections of interest. Additionally, the use of high-resolution mass spectrometers has provided the opportunity for simultaneous detection of subsequent pharmacodynamic (PD) responses within a single image acquisition. The ability to assess PK/PD relationships in a label-free, in-situ context has proven invaluable to the early lead optimization efforts that take place in the drug discovery setting. Similarly, uncovering the perpetrator of adverse findings often associated with histopathological assessments in the preclinical development phase have also improved our understandings around the mechanisms of toxicity and can provide useful information for the redesign of a back-up molecule. This seminar will provide a synopsis of the advantages of imaging mass spectrometry, as well as, the technical challenges and opportunities in the context of the pharmaceutical industry. Examples will include MALDI-IMS of dosed tissues in support of drug efficacy, PK/PD, and effective delivery evaluations, highlighting the simultaneous detection of drug, metabolites, and endogenous components attainable from a single imaging run. Additionally, examples demonstrating the utility of imaging MALDI MS for toxicity screening, as well as, its complementary use with autoradiography analyses will be discussed, including ocular drug distribution and whole-body drug disposition studies. Acoustic mists of less than 20 nL volume that transfer samples from 384-well microtiter plates to a mass spectrometer. Rapid movement of an acoustic generator enables Acoustic Mist Ionization (AMI) to run MS-based HTS assays faster than 3 samples per second. This produces multi-analyte, label-free data without tips, chips, columns or clean-up steps. Microplate-based automation achieves walk-away automation of over 100,00 wells per day. Results of HTS assays of over 2 million compounds in a primary screen, as well as results from secondary screens, will be presented. Also, the low volume of AMI allows kinetic analysis as the same well can be re-sampled hundreds of times. This overview includes AMI technology detection of nucleic acids, lipids and metabolites as well as recent proof-of-principal experiments for “in-well”, liquid-liquid-extraction (LLE) to show the high-throughput analyses of complex mixtures. Unambiguously elucidating drug action in cells is a key step towards successful development of novel medicine. Small molecule drugs elicit therapeutic effect through their interaction with intracellular proteins, including on-target proteins for desired mechanism of action, or off-targets which sometimes results in potential toxicity. While screening assays such as kinase activity assay or GPCR assay are routinely used to assess compound specificity within a set of enzymes in vitro, mass spectrometry-based proteomic approaches allow direct detection of drug-protein engagement in cells, in a global and unbiased manner. Our group implemented several complementary technologies to identify in situ drug targets for new compounds in discovery and early development stages. Results generated by these experiments allow the project team to assess molecular action in cellular environment, which is useful for hits coming from both molecular target-based screening and phenotypic-based screening. This presentation will feature a few case studies using these technologies. Benefiting from rapid advancement in mass spectrometry technologies, LC-MS/MS platform has been increasingly applied to quantify therapeutic peptides and proteins in different biological matrices to support pharmacokinetic and pharmacodynamic studies. To achieve required sensitivity, biological sample clean-up and target protein enrichment during the LC-MS/MS assay development is a critical step. While immune-affinity (IA) based method is the preferred approach when possible, its application is often limited in discovery stage due to lack of suitable capture reagent. As part of the industrial effort to develop reagent free workflow to enable efficient discovery program support, we have developed 96-well plate format, molecular property based reagent-free LC-MS/MS assays to quantify different therapeutic proteins in plasma or serum samples. Michael D. Scholle, MS, MBA, SAMDI Tech, Inc.
High-throughput screening is an important tool in drug discovery to identify small molecule modulators of biochemical activities. Most assays rely on cumbersome labels, such as fluorophores, antibodies, and radioisotopes that increase costs and can produce high rates of false-positive hits. Label-free formats address many of these limitations, but current approaches often lack the throughput necessary to accommodate large screening campaigns. Here, we present a label-free, high-throughput assay and apply it to analyze therapeutically-relevant targets. The assay combines Self-Assembled-Monolayers on high-density biochip arrays and matrix assisted laser desorption ionization (MALDI) mass spectrometry, a technique termed SAMDI, that enables rapid and quantitative assays capable of screening 100,000 compounds per day. The ability to directly visualize and measure the reaction products not only eliminates false positive hits, but also provides a data-rich output that accelerates drug discovery efforts. Altogether, the SAMDI assay opens avenues for faster, more reliable, high-throughput screens for a broad range of biochemical activities. For general inquiries regarding LRIG Bay Area, contact Mike Biros. Circuit Therapeutics is the industry leader in optogenetics, pioneering new treatments using this groundbreaking tool. Optogenetics utilizes light to excite or inhibit nerve cells with precision and biologically-relevant timing. This transformational technology is enabling researchers to modulate neurons and neural circuits in vitro and in vivo to gain insight into the circuits function in health and disease, to simulate disease state, or for development of new therapeutic interventions. Optogenetics has gained rapid acceptance globally and is being used in research laboratories worldwide. Optogenetics requires two key components: A light-sensitive protein, or opsin, and light. Depending on the opsin, light can either activate neurons with excitatory opsins (Channelrhodopsin), inhibit neurons with inhibitory opsins (NpHR, eArch), or initiate cellular signaling cascades (OptoXR). By activating or inhibiting individual circuits in the central and peripheral nervous systems, we can modulate the animal&#39s behavior, explore the fundamental function of a given circuit, or modulate the specific symptom of a disease. The understanding of the consequences of activating or inhibiting individual circuits on symptoms and behaviors leads to novel treatments and therapeutics. Using Optogenetics we map brain circuits that are responsible for specific neuropsychiatric disease symptoms, and gain insights into the etiology of the disease. By characterizing the underlying neuronal sub-populations we are able to discover novel drug targets that modulate these circuits. We can then use circuit-based rodent models to test drugs, and use our understanding of circuitry to perform more effective clinical trials, delivering the right drug to the right patient. Optogenetics facilitates new ways to approach drug development in the nervous system with the potential to treat any neurological disease with higher precision and less side effects. The blood-brain barrier (BBB) poses a major challenge for developing effective antibody therapies for neurological diseases. Using proteomic analysis of isolated mouse BECs, we identified multiple highly expressed proteins, including basigin, Glut1, and CD98hc. To measure if these targets can be utilized to bring therapeutic antibodies into the brain, Bispecific antibodies were generated, pairing with an anti BACE arm to reduce AΒ in the brain in order to further demonstrate that the antibodies are delivered into the brain parenchyma as measured by pharmacodynamic response. When assaying antibody concentration in the serum and brain, we encountered strong matrix interference. To overcome this issue the human IgG assay was generated in the Gyros platform which was able to tolerate up to 10% brain matrix. Using the Gyros human IgG assay we were able to show that antibodies against CD98hc showed robust accumulation in brain after systemic dosing, and a significant pharmacodynamic response as measured by brain AΒ reduction. To further investigate safety profile of targeting CD98hc, we generated a cell based amino acid uptake assay and also investigated the trafficking of internalized antibody and CD98hc using Phoenix high content imaging system. We were able to demonstrate that antiCD98hc antibodies did not block amino acid uptake in cell based assays and did not induce CD98hc trafficking to the lysosome. The discovery of CD98hc as a robust receptor-mediated transcytosis pathway for antibody delivery to the brain expands the current approaches available for enhancing brain uptake of therapeutic antibodies. Cognitive control is defined by a set of neural processes that allow us to interact with our complex environment in a goal-directed manner. Humans regularly challenge these control processes when attempting to simultaneously accomplish multiple goals (multitasking), generating interference as the result of fundamental information processing limitations. Furthermore, these same cognitive control abilities show distinct impairments not only when one ages, but also when faced with a number of clinical impairments. Here I will describe our novel approach to characterizing and remediating deficiencies observed in these cognitive control abilities using video game like technology in healthy young and older adults, as well as clinical populations involving ADHD, autism, and depressed individuals amongst others. The research associated with these efforts will describe one particular cognitive training approach for older adults using a custom video game called NeuroRacer: critically, this training resulted in performance benefits that extended to untrained cognitive control abilities (enhanced sustained attention and working memory), with an increase in neural activity associated with cognitive control predicting the training-induced boost in sustained attention and preservation of multitasking improvement 6 months later. These efforts now extend to using these tools in different populations and technologies: Dr. Anguera will take conference attendees further into the realm of mHealth technology and applications as he shares the results of the BRIGHTEN study on how incorporating mHealth technology can improve recruitment and retention for clinical trials. His session also will address the value of mHealth technology in working with mental health issues, and how leveraging approaches and innovations typically seen in the video games can positively disrupt the way cognitive control abilities are assessed and remediated today. Ion channels regulate cell membrane electrical signal excitability, signal propagation, fluid homeostasis, hormone and transmitter secretion, thus are important drug targets for many pathological conditions. Emerging evidence implicates that voltage gated sodium channel Nav1. 7 is the threshold channel mediating pain sensitization in humans by amplifying small subthreshold depolarization in peripheral nerve fibers and dorsal root ganglia. Multiple technology platforms have been established for voltage gated sodium channel drug screening, however electrophysiological patch clamp remains the gold standard method by offering the most direct and information-rich assay, but is limited by throughput. Here we report the recent breakthrough of utilizing automated patch clamp (APC) technology to screen for Nav1.7 modulators from a ~10,000 compound library. The APC screening was optimized by balancing cell patching success rate, signal window, signal stability, and reference inhibitor sensitivity. The overall whole cell APC success rate was achieved at 81%, with average Z Prime 0.72, and correlation coefficients R > 0.9 with conventional manual patch clamp. A GeneData high-throughput data analysis method was also developed to achieve fast data analysis. Follow-up hit confirmation, subtype selectivity and mechanism of action studies were also performed. In summary, the results demonstrate that our newly developed APC and HTS data analysis platform provides a robust and reliable electrophysiological functional assay for Nav1.7 modulator screening and lead profiling. For general or vendor inquiries regarding LRIG Bay Area, contact Mike Biros. Program updates on Twitter: @lrigbayarea and @m_biros.